The Vice Major of the city of La Ceiba was ambushed; shot 5 times and killed on his way to City Hall from his home at around 7:00 Am today. Yesterday on a TV / Radio news interview he mentioned that he did not need “body guards” as he had no enemies. 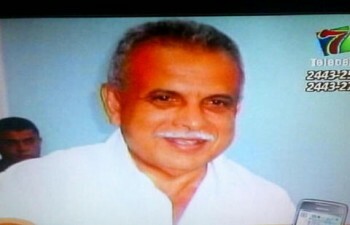 This morning Angel Salinas the vice Mayor of La Ceiba was shot 5 times while on his way from his home to city hall. He was rushed to the hospital but passed away. Mr. Salinas was gunned down by two assailants who were onboard a motorcycle and pulled up to his vehicle and shot him according to witnesses. He lost control of his pickup which then rolled on its side at the edge of the highway. At the moment there is a strong law enforcement effort investigating the tragedy. Mr. Salinas was well known and liked in the city of La Ceiba and is survived by two daughters who are members of the United States Armed Forces. A staff member of the HondurasNews.com / Honduras.com spent time with him yesterday afternoon. We have known him personally for many years and our deep condolences go out to his family. The police in the afternoon presented to the press two suspects that have been detained in connection with this tragic crime. They are: Selvin Onán Argueta Almendares (19) and José Camilo Rosales Gómez (53), who police accuse of providing a vehicle to escape in. The two suspects maintain their innocence and stated they have nothing to do with the crime. We will update you with more on this story as it becomes available.